G&B offers a wide range of engineering services to assist you in running your projects, optimising cost (without increasing your initial investment) and keeping your delivery dates. The company’s specialised teams can assist you during the full design phase of your project. The company uses the best and latest software and hardware in the market to ensure best results in your projects and our QA department controls all the project’s tasks to avoid a badly resourced management. Our experience with the internal procedures could assist you with your effort of keeping your project cost controlled and on schedule. The Group’s companies are located in UK, Spain, USA and Mexico and are well accustomed to operating internationally and consequently, the group’s engineers are familiar with the different international standards, as well as with the internal codes of main industrial countries. G&B draws on this extensive expertise when undertaking international projects. 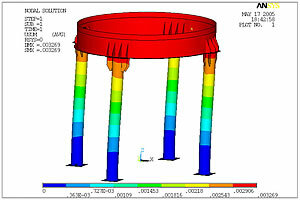 Capability: Comprehensive Finite Element Analysis (FEA) of structural and equipment components in the petrochemical, Oil&Gas, power generation, Nuclear, pharmaceutical, automotive the general mechanical engineering industries, covering piping, vessels, structural and machine components. A typical mechanical FEA would obtain engineering analysis solutions such as displacements, stresses, natural frequencies and buckling modes, for static and dynamic loadings. FEAsoftware: NEI Nastran, Ansys, NozzlePro, AxiPro, Abaqus, Solid Works and others. G&B Engineering Services provides its expertise and services to the engineering, consultancy and outsourcing areas of the oil and gas, refining, chemical, power and other engineering industries. More. G&B Engineering Services provides its expertise and services to the engineering and consultancy areas of the oil and gas, refining, chemical, power and other engineering industries.More. To continue to be known for delivering high quality mechanical engineering services to the global oil and gas, refining, chemical, power and other engineering industries. More. With the extensive experience of its engineers and draughtsmen, G&B can provide full mechanical design and analysis of piping and ducting to all industrial plants. More. G&B can provide full mechanical design and analysis of any pressure containment equipment to most national and international codes. More. The company's expertise covers structural design and analysis of offshore and onshore structures to most international and national codes. Being also familiar with the latest construction techniques, our engineers can provide full design services to cover foundations and earth retention structures. More. G&B's engineers can assist you in developing effective measures for your project scheduling and cost control. More. G&B has the capability of providing a comprehensive Finite Element Analysis (FEA) services on equipment and structural components for any industrial plant application. More. G&B´s engineers have the knowledge and experience to assist you with your power project design. More. With its extensive knowledge and experience in this area, G&B engineering team can assist you with your project design. More. With its knowledge and experience in this area, G&B engineering team can assist you with your project design. More. With its broad knowledge and experience in the design of such plants, G&B engineering team can assist you with your project design. More.